Apple on Wednesday formally launched its anticipated new low-end 21.5-inch iMac with a lower entry price of $1,099, boasting a 1.4-gigahertz dual-core Intel Core i5 CPU, a 500-gigabyte hard drive, and 8 gigabytes of RAM. The new machine comes in a full $200 cheaper than the 21.5-inch 2.7-gigahertz model, which served as the previous low-end model. That faster model, along with Apple's other all-in-one desktop configurations, remains unchanged. For $200 savings, users will downgrade from a faster quad-core chip to a dual-core CPU. RAM stays the same, but hard drive space is cut in half from 1-terabyte on the $1,299 model. Graphics are also downgraded from Intel's Iris Pro integrated solution to Intel HD Graphics 5000. The new model can be upgraded with a 1-terabyte Serial ATA drive for an additional $50, a 1-terabyte Fusion Drive for $250, or a 256-gigabyte flash drive for $250. The 1.4-gigahertz processor and the 8 gigabytes of RAM cannot be upgraded. Despite the new lower pricing, authorized Apple resellers are already offering a much better deal on the the more well equipped 2.7-gigahertz Core i5 model, boasting a 1-terabyte hard drive and dedicated Nvidia GeForce GT 640M graphics. As can be seen in the AppleInsider Price Guides, that configuration can be purchased for just $999 after a $70 mail-in-rebate (PDF) through MacMall, making it a much more powerful computer at $100 less, and tax-free in 41 states. Apple issued a press release Wednesday morning touting the machine as "the perfect entry-level Mac desktop." Sporting the same thin design as all other current iMacs, it features 802.11ac Wi-Fi, two Thunderbolt ports, and four USB 3.0 ports. It also comes with iLife —featuring GarageBand, iPhoto and iMovie —as well as the iWork suite of Pages, Numbers and Keynote. 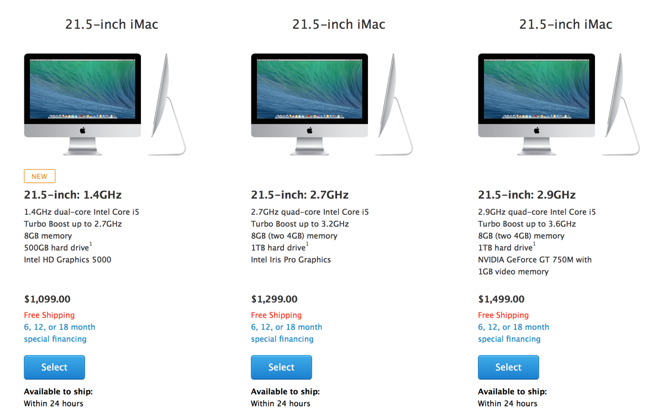 The new 21.5-inch iMac also comes with OS X Mavericks, and can be upgraded for free later this year to OS X Yosemite. In addition to being available through Apple's online store, it will also be available at Apple retail stores and authorized resellers. The last time Apple offered a $1,099 iMac was in early 2013, but that model was only available for sale to educational institutions. Apple hit that price point with a dual-core 3.3-gigahertz Intel Core i3 processor and Intel HD Graphics 4000.